New Year’s resolutions can be hard to keep, especially if your family hasn’t made the same goals. Different resolutions don’t have to divide you, though! Here are three tips for keeping fitness and nutrition resolutions that model healthy behavior for the whole family. After school, between meals, and before bedtime: these are all times when you try to keep your kids’ eating habits under control. They’re probably also the times when you’re most tempted to munch on snacks that aren’t quite healthy. Help yourself and your family by ensuring you have lots of quick, easy-to-eat, nutrient-dense snacks on hand, and make snack time family time. Keep ripe avocados at the ready to slather on toast. Make (not-too) sweet and salty fruit and nut squares packed with vitamins, fiber, and heart-healthy fats. To avoid afterdinner snacking, drink lots of water, and make it interesting by infusing it with fruit and herbs (lemon and rosemary, strawberry and basil, cucumber and mint are all good combinations). Stock the pantry with a variety of herbal teas. Rooibos and honeybush have a natural sweet taste to them, which can curb cravings without adding sugar. If you have young kids and a busy schedule, finding time to get to the gym can be a big challenge. Does your local recreational facility have a family package? Swimming or sports for the kids? Or can you find ways to get active with everyone right at home? Hit two resolutions in one by setting aside a specific hour or part of the day when the whole family gets off the couch or away from the desk to get the blood pumping. Try practicing your family’s favorite sports in the backyard, or going for a walk-and-talk every night after dinner. Challenge your kids to come up with an active game that will push your cardiovascular limits. Use their imaginations to get in shape! 3. Get excited about fruits and vegetables. Kids can be unbearably picky with their food, and some adults get so stuck in their ways that they have a hard time changing. 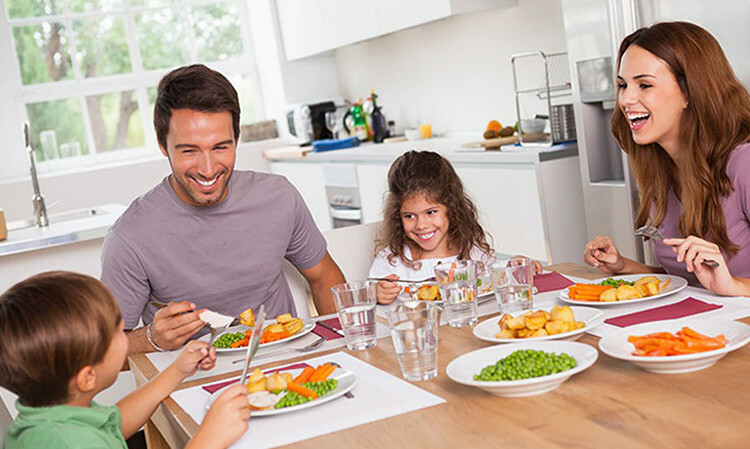 Get out of food ruts and give your kids a healthy start by refocusing your meal plans around vegetables. Make a meal of produce showing off your kid’s favorite color. Cut veggies into neat patterns or shapes. Try blending a mix of hearty veggies into a thick, starchy soup, like squash, potato, or corn. Start every meal with a colorful, crunchy salad. Keep a bowl of chopped up fruits and veggies in the fridge at all times, with sweet and savory dips for spicing things up. Avocados are great for making dips and smoothies, so keep a bowl of them on the kitchen counter. Most importantly, be flexible! Don’t give up on your resolutions if you don’t feel like a success every single day. Keep working at it, and let your kids see the results of dedication and resilience. Every nutrient-dense snack, every moment of movement, and every fruit and veggie you eat gets you one step closer to a healthier, happier you.